If you’ve ever wondered what a flex shaft can do, Andy Cooperman offers you this counter challenge: What can’t a flex shaft do? 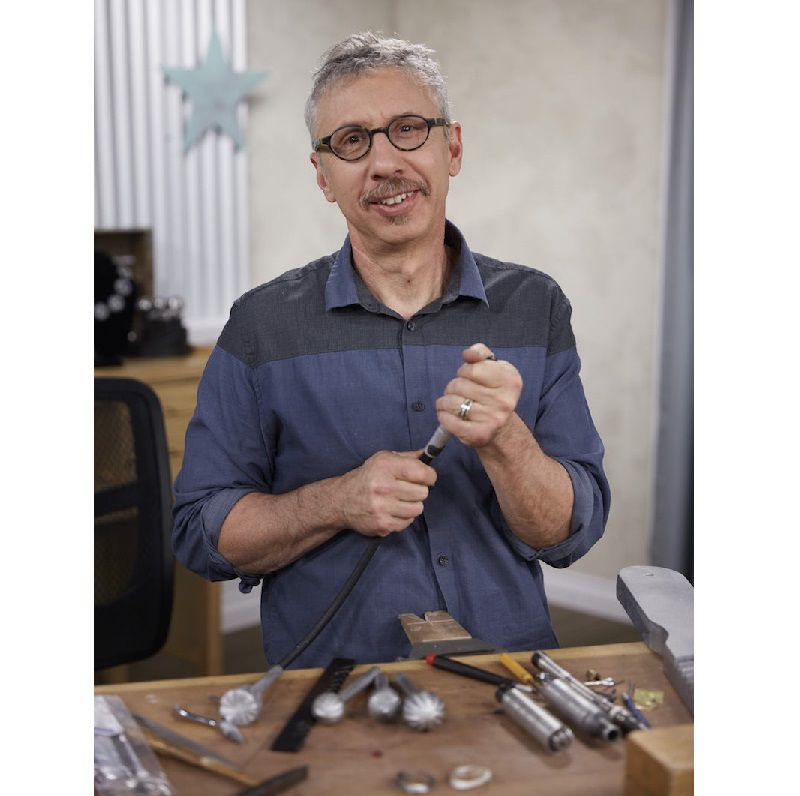 As a metalsmith, teacher, writer, and self-described “creative pot stirrer,” Andy has a unique ability to find innovative solutions to metalworking. 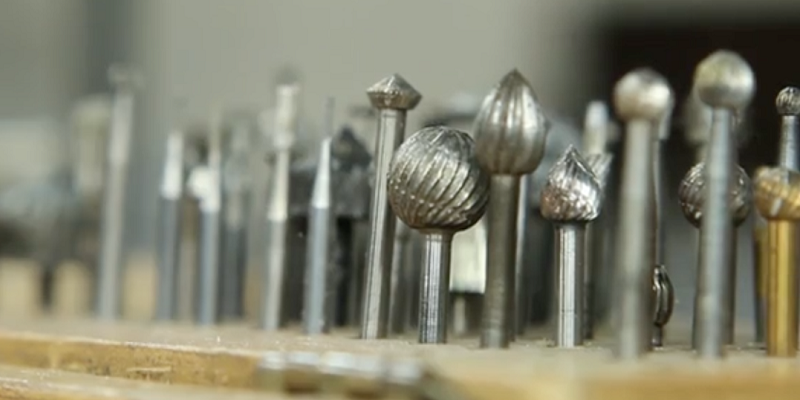 His approach to tools goes far beyond a typical use-as-directed tagline. This problem-solving spirit is especially evident with the flex shaft machine. Can you identify each bur? Give it a try in Andy’s online workshop! Believing that making is hard-wired into us as a species, Andy has a passion that is inspiring to watch. Andy constantly reminds us how powerful it is to see the effects of working with our hands, using tools like the flex shaft, and making our mark. That passion is contagious. Whether he’s sanding a ring with a slot mandrel loaded with sandpaper or exulting in the freeing qualities of rubberized abrasives, he invites us to participate in his excitement. You can’t help but get caught up in it! 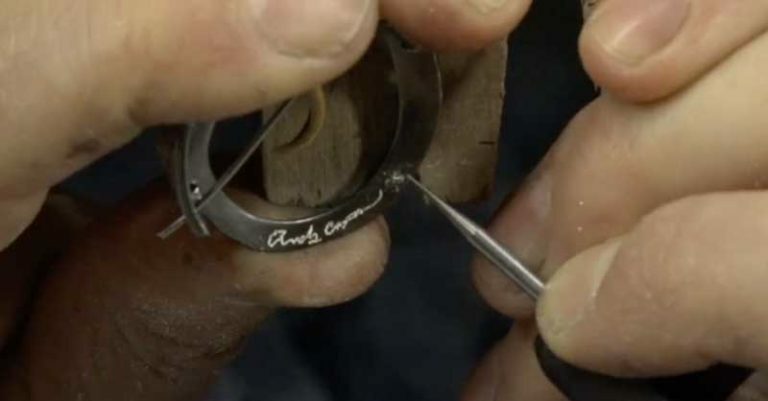 Andy uses a tiny ball bur to sign his work in excruciating detail. Part of what makes Andy’s flex shaft tutorial so exciting is his prodding to think beyond traditional problem solving. 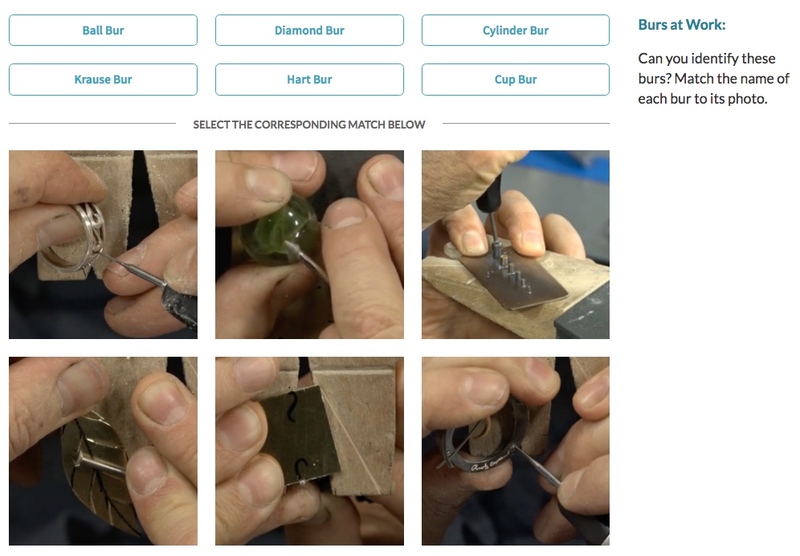 If you think a stone-setting bur is only used for setting stones, think again. 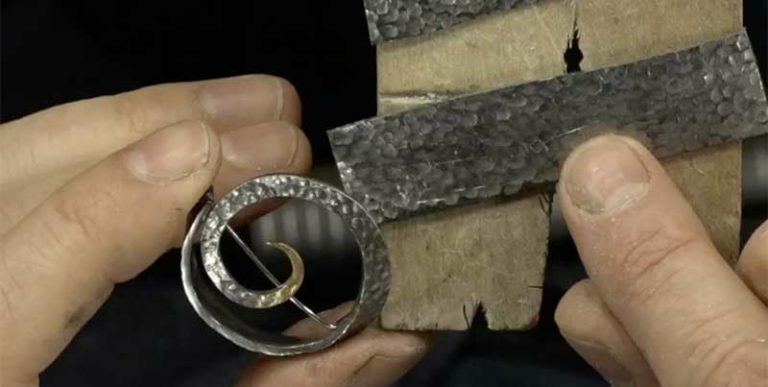 And although a hart bur works great for cutting seats in stone settings, Andy also introduces us to its nontraditional capabilities as a decorative engraving tool. 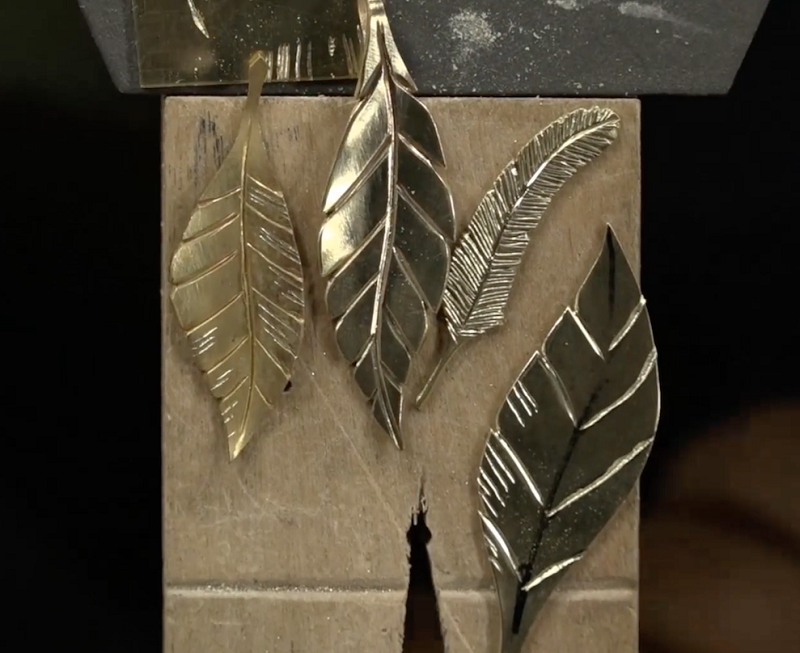 A hart bur brings these decorative leaves to life. On the topic of burs alone, he covers 10 different types, bombarding us with delightfully unexpected ways to use each. Then he moves on to even more flex shaft accessories, giving us his insightful takes on those as well. The flex shaft offers countless ways to carve, forge, notch, smooth, texture, trim, score, sand, contour, polish—the list goes on. Andy shares multiple ways to create eye-catching texture. He gives us several examples of this kind of improvisation. If you don’t have hard flex-shaft-ready felt rods, for example, he suggests trying a cotton swab, a bamboo skewer, or even a toothpick. He turns the tables in other ways, too. Something has to spin, but it doesn’t always have to be the tool. He demonstrates inserting a small piece of tube into the flex shaft, which then spins as he holds a cup bur steady above it. The flex shaft at work: What can’t it do? Andy’s workshop is a smorgasbord of tips, tricks, and ideas. 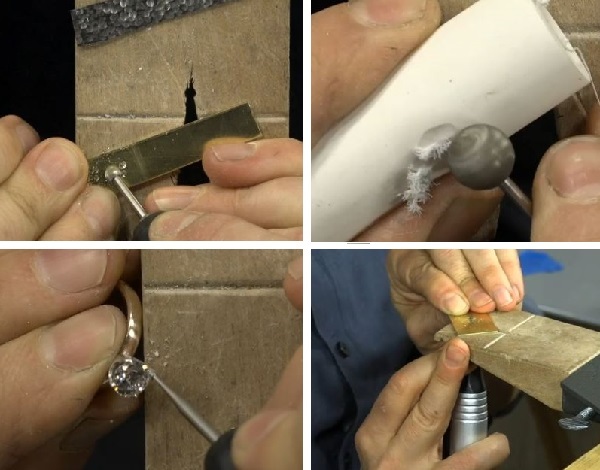 From how to get a broken drill bit out of a piece of jewelry to how to dress rubberized abrasives, you’ll learn all kinds of useful tidbits. These top five flex shaft tips from Andy are just an appetizer! The flex shaft’s many accessories make it extremely versatile in the studio. Protect yourself from particles. Wear a mask and safety glasses and work in an area with proper ventilation. If you hang your flex shaft at a height of 24 inches instead of the typical 30 to 40 inches, you’ll have more flexibility. For example, you can use the side surface of a separating disc as a turntable or use a cylinder bur as a router. It’s so important for you to put work out in the world that’s well made and considered. 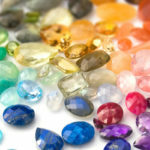 If you cause somebody to bleed with the jewelry you make, you have lost a customer. Go the extra mile to make sure all edges and wires are smooth and finished. Experiment with different types of rubberized abrasives. For instance, label the side of each wheel with a marker so that you can keep track of which kind works best for you. Everyday items can suddenly become just what you’re looking for. Even tools made for specific purposes can be applied in far broader contexts. If you use your tools in the widest possible application, you’ll need fewer tools and gain more satisfaction from your work. With the wealth of information available in this online workshop, you’ll no doubt be torn between two tantalizing options: watching Andy on your screen or getting busy in your studio. You’ll just have to do both. 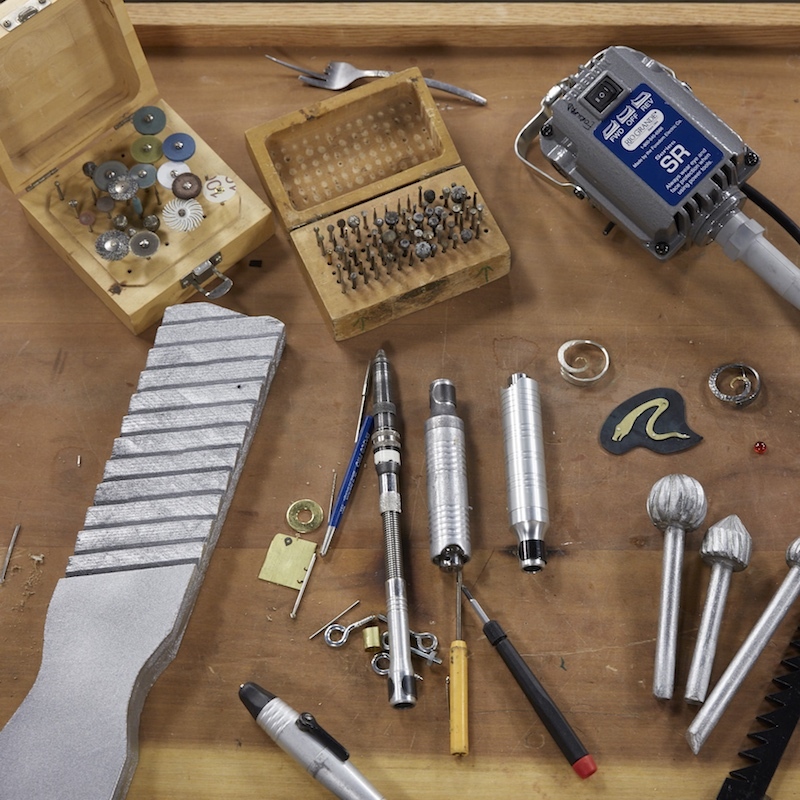 Discover how many ways your flex shaft can help you in the studio with Andy Cooperman!